Dinosaurs and their eggs are under attack by hungry cavemen and only you can save them in this action-packed dinosaur defense game. Join the Jurassic battle! Lead the dinosaurs in a Jurassic tug-of-war battle against primitive humans to defend your dino egg from their merciless appetite! Build ground defenses, deploy aerial attacks, and summon dinosaurs to avoid extinction! Unleash an army of T-Rex, Triceratops, Raptors, and more savage dinosaurs and defend your precious egg from hungry, hungry cavemen. Summon volcano bombs, ice rocks, hidden traps, vicious blizzards, and decoy eggs against these invading fools. Aim and strike! UPGRADE YOUR FORCES! FEEL AWESOME ABOUT IT! Strengthen your dinosaurs, upgrade your arsenal, reinforce your defenses, and laugh - or panic - at the cavemen’s stubborn attacks. Help the dinosaurs avoid extinction in 100 hand-drawn levels of primal tug-of-war defense. Cavemen have never looked this beautiful. 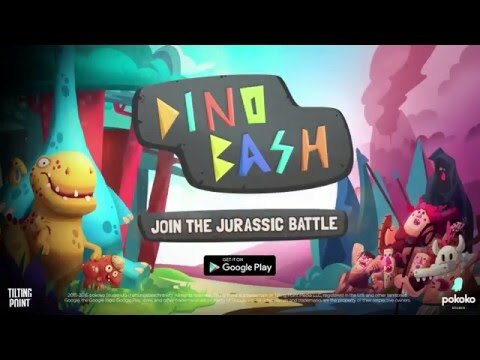 While Dino Bash is completely free to play, some extra in-game items will require payment. You can turn off the payment feature by disabling in-app purchases in your device’s settings. The events depicted in the game are not historically accurate. Any resemblance to real dinosaurs, living or extinct, is purely coincidental.